Marriage is one thing that has made us grow. Of course there are times we get onto each other’s nerves but we have learnt to kiss and make-up, quickly before either of us broods a non-issue to an issue. We decided not make issues of what are not, and those that are, we learn to reach an equitable compromise without either side feeling as if they are losing. 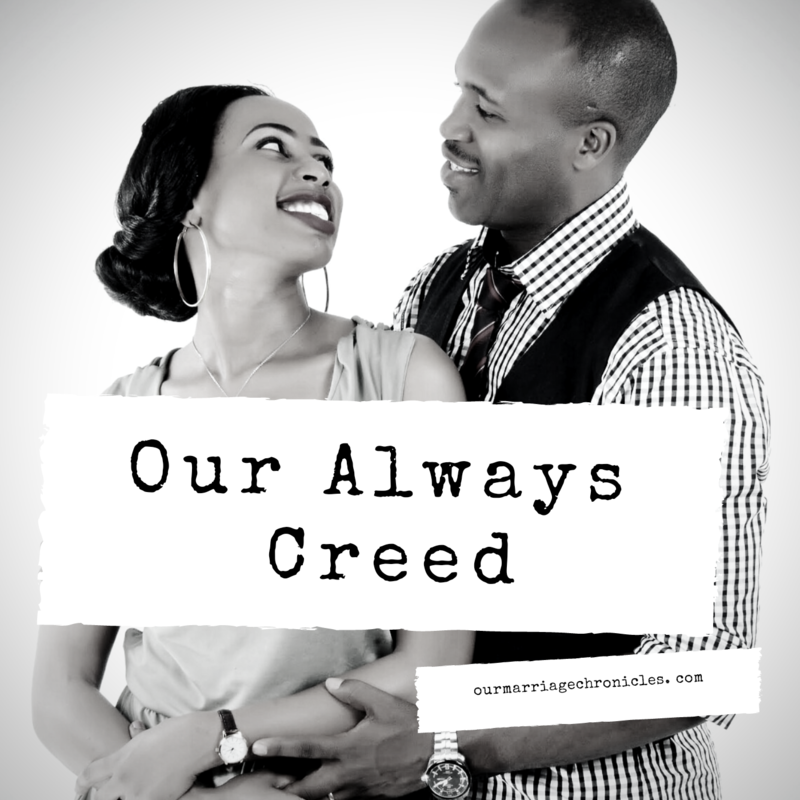 When we got married, we decided on a couple of things, we made THE CREED, which has OUR NEVER CREED and OUR ALWAYS CREED. Just had to share it with anyone married or about to get married. Sometimes, we fail, but we quickly remind each other, that we can do it. We are better. That’s why we will always say, #marriageworks. This is OUR ALWAYS CREED. Always be loyal to each other and to your vows. It’s easier said than done. Trust me, having a husband who is in the military takes God’s grace for him to go and come back. It takes God’s strength to keep to your vows. It is never by our own strength. The wedding has a lot of pomp and it only hits you when you start the journey of marriage after the wedding. The vows are really tested, and the REAL test is enduring to them when everything is shaky. When you don’t understand anything. When your husband is laid off, when you both have recurring misfortunes, when your husband made a miscalculated judgement, when he doesn’t seem to get you, when your career seems to be overshadowing your time together, when your mother in-law wants grandchildren so bad… Times can be shaky, but Always be loyal to each other and to your vows. Always forgive with all sincerity of your hearts. If there is anything that can kill a marriage, is holding onto anything that has been done offensively against you. Trust me, I was so bad at this area. Until the Lord told me “it is you, not Johnny”. I had to let God change me, before asking Him to mold my husband. I still ask the Lord to help me. Forgiving is hard! You will fail each other. 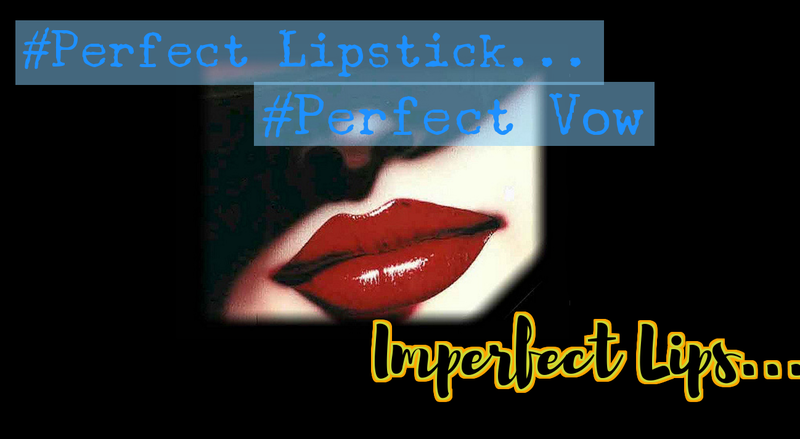 None of you is perfect. When you anger your spouse, ask for forgiveness, and be ready to forgive each other 70 times 7. Forgiveness brings freedom, forgiveness brings joy, and forgiveness brings true love. Forgiveness is the only good thing you can do for your soul. Always admit when you have offended each other; Say “Am Sorry, Forgive me”. Always be open to be corrected. You both are never perfect, and your marriage cannot grow if both of you are stuck to your own individual ways. Growth happens when the tree is pruned. Accept to be pruned by your partner. I know most husbands fail in this area, but you can decide to slowly take the steps, and let your wife be your mirror. She’s actually your mirror – how well you are growing towards being Christ like! Polish each other, let your spouse clean out that grimy grease off your countenance. You will be brighter! Only the wise accept counsel and correction. Do not shout at each other. Do not scold each other. Do not patronize each other. Remember Proverbs 15:1. If you don’t correct in love, you will force your spouse to dig in into their heels and get their defense side on. The HOTDOG WAY has always works for us. Try it! Always hope for the best and make the best of what is there. Circumstances change, there are seasons of lack and there are seasons of plenty. Make the best of what is there. Accept what cannot change and be ready to take another route. For me, as a wife whose husband is always on call, I have made it my goal, through the Lord’s strength, to make the best of any situation, and enjoy every moment of my life. You don’t need to have a husband or wife who is always away to stir you into making every moment count. You just need to make a decision. That my marriage will be phenomenon and stupendous! Keep hope, but make the best of your current situation. Always strive to reach an equitable compromise. That is, you do not necessarily need to give up something on either side. You can do them both. You can go to his favorite game, and he can later take you to the spa. The best compromise is when you both don’t need to compromise but find ways to do both “things” together. Always strive to willingly yield each other’s wishes. You were born in different places, different mothers, different fathers, everything is different. You cannot possibly agree on everything unless one of you is pretending. So try to honor each other’s wishes, if not find a focal point where you both agree. Do not manipulate each other, do not coerce each other. Support each other’s vision and push each other to be better. A marriage improves if both partners constantly improve each other. Always take care of each other. No matter how long you have been married, your husband or wife comes first. Not your children, not your ministry, not your job. So take care of him first before anything else. He is your first business. She is your first business. Your house help shouldn’t be taking care of your husband, you should. Take care of the “small requests” to the biggest of them all! Always say kind and loving words to each other. “I love you”, “I miss you”, “You are my one and only”. The list is endless. Kind words build each other. Do not let a day pass without being sweet to each other. You can never be young in each other’s eyes. As much as words can hurt, they do build too! Build each other with kind and loving words. Always value each other’s friendship, no matter what the distance. You should be each other’s best friend forever. My husband is truly my best friend. With him, am myself, nothing is in pretense. I give him all the juicy stories. I know he is one person who can just keep quiet and listen to me talk and talk. Confide in each other, talk with each other, walk with each other. You should be as eager to share those ‘411s’ with your husband as you are to your girlfriends. Talk often, communicate often, be goofy, have fun, explore new places and ventures, after all that’s what best of friends do, right? Always be humble to listen. As much as you are best of friends, always listen to each other. Listen and listen keenly. Sometimes just keep quiet and let him talk. Sometimes, just let her talk. You might be shocked how deep a well of wisdom you both are to each other. Always be patient to teach each other. No one is perfect. You will fail each other’s expectation more often than not. That’s is where love so patient comes in. Be patient to teach each other. Patient to “put up with a lot” and tolerate each other, being slow to judge, and accepting each other as they are. Love that is patient prays for each other, and let’s God work in your spouse. Not ministry, not your children, not work, not your mama or dad, not your nuclear family. Always protect each other. Boundaries should be THICK! Please don’t shame each other. Mrs. Don’t take to Facebook, or whichever social media to shame your husband no matter what sin he has committed. Mr. Do not shame your wife before your friends or family. Protect each other and cover each other’s weaknesses. Boundaries work! Protect your marriage. We personally don’t have a private phones, private emails, private chats, and private tablets. It helps to build trust! Boundaries should be so THICK MR! TOO THICK FOR YOU MRS! Boundaries work! So protect each other. If you sense a loophole, be quick to fill it, i.e. both of you. Always let the SELF die, every day. I know the guiltiest party to this are the women. We are too good in manipulating to get our way. The me, myself and I attitude has to die daily. We are selfish by nature, and most of us carry that baggage to marriage too. Deny the self. Love so unconditional can only thrive in an environment that is unselfish, with a man or wife willing to give without expecting anything. Let the SELF die. It doesn’t have to go your way Mrs.. Mr., Love her as Christ Loved the Church. He gave Himself willingly to us. Otherwise, we would all be doomed! Always find ways to make each other better. Encourage her to be best, encourage him to be the best. Do not muzzle each other’s vision. Push each other to be the best in business, education, career, anything. Push your husband to be the CEO! Trust me, he will. Push your wife to be the CEO, to get her PhD! She will. Make each other better! A couple that keeps improving together, make their marriage improve. Always be honest and truthful with each other. And when you are told the truth ..again..always be open to receive that correction. Never let assumptions come in between the two of you. If you do not understand each other, ask. Do not let secrets to be part of your daily life. Be open and trust each other with all that you have and all that you have got. Dear wife, if you don’t understand anything, please ask, don’t snoop through your husband’s phone. It is a disease that will slowly eat you. Soon, you will be finding faults where there are none. It erodes your confidence, and esteem, so deal with your insecurities by shifting your focus from your Husband to Christ! Trust the Lord! Trust the one who sees beyond the phone! Mr., your part, is to be open! Totally transparent! Actually, both of you need to be open! Always Trust each other. Do not work with assumptions ask, if you are not sure, that is what best of friends do! 20. Always work as a team. We are partners, for life. He has my back I got his. Team members fight for each other, work together, and at times, they carry each other, and each other’s burdens. So work as a team. You are in one long marathon race. So pace your steps together. You are not competitors, like Safaricom and Airtel. 21. Always remember God. Always remember to pray together. Marriage cannot function without God. Always remember to pray. As a wife, you cannot build your marriage without God’s wisdom. Submission is only taught by Christ! Husband, you cannot live in understanding with your wife if you cannot let Christ be your head as a husband. Pray and pray for your marriage, for each other. Prayer is not cliche. A family that prays together, stays together. Prayer works. Previous PostMy testimony Part 2- in the wilderness...the Lord remolded me. Next PostOUR NEVER Ever CREED.